The versatile SJ 3220 scissor lift with a lift capacity of an impressive 900 lbs and working height of 26 feet or (9.3) meters. The narrow conventional series DC Electrical scissor lift provides a huge reinforced steel platform and makes the Skyjack 3220 scissor lift perfect for any ‘on slab’ related applications. This particular Skyjack model is drivable at full height, and carries a multiple speed rear wheel hydraulic drive. 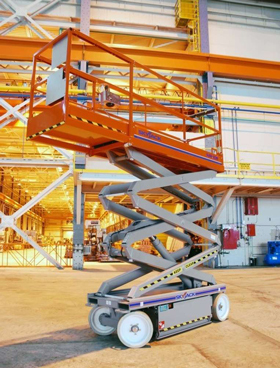 Other standard features of the SJ 3220 scissor lift include dual holding brakes and a 3 foot roll out extension deck. The Skyjack 3220 scissor lift also carries an analog control system, and is powered by a 24 volt DC power source transporting easily on durable solid rubber, non marking tires. Other standard features of the Skyjack 3220 scissor lift include an electric tilt alarm, all motion audible alarm system, operator horn and is safeguarded with a hinge railing system equipped with forklift pockets and sturdy tie down-lift lugs. The Skyjack SJ 3200 scissor lifts are the right choice when you need abundant working space and maximum lifting capacity without sacrificing maneuverability. The Skyjack SJ 3220 scissor lift is capable of maneuvering even in the smallest spaces with an outside turning radius of 108 inches or 2.7 meters. 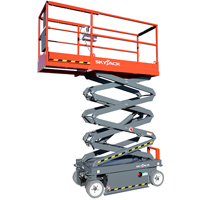 Ideal tasks for the Skyjack SJ3220 Scissor Lift include office fitting out, retail (including fitting out and general up grading of store such as hanging point of sale), mechanical engineering, joinery, facilities management, electrical contracting, cleaning, plumbing, warehousing and decorating.